Instrumental apparatus and/or facilities with high performance is popular to elucidate the observation in a wide variety of research fields in marine science and technology. To support research and the education activities, the center for instruments and facilities was established in 2008. 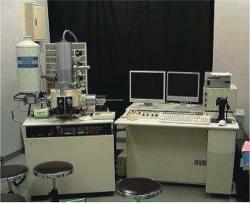 The Electron Microscope Facility is located in Building 11 (Special Research Facilities Building) at Shinagawa Campus. It comprises a transmission electron microscope, a high resolution scanning electron microscope, a cryo stage-coupled ultra low-vacuum scanning electron microscope, and an electron probe microanalyzer. This equipment is useful for observation of the ultrastructure of aquatic organisms, microorganisms, viruses, and food materials, for analyzing processes such as the freezing and thawing of food materials and deterioration of vessel structures, and for the elemental analysis of hard tissues of aquatic animals and industrial materials, among other uses. This facility was constructed in 1981 and is equipped with a towing carriage, wave making device, water circulating device and so on. Many kinds of experiments are conducted in this basin, especially studies on ship resistance and propulsion, ship maneuverability, ship motion in waves, performance of offshore structures and fisheries facilities and so on. 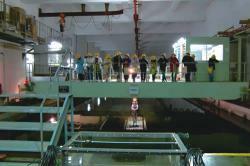 Vertical circulating channel, wind basin and anchor basin alsobelong to this facility. 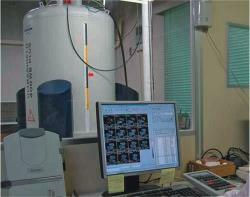 This facility was installed in 1987 as the first micro MRI in Japan. It was renewed in 2006 and has been used for high resolution measurements of physiologically active substance, for diffusion measurements of polysaccharides, and for measurements of cellular size by using the field gradient of up to 30 T/m.